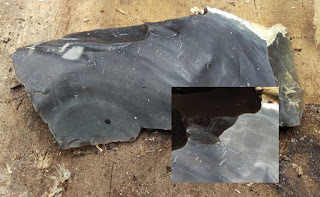 www.Sarsen.org: Neolithic Flint Shattering Using Thermal Shock. Neolithic Flint Shattering Using Thermal Shock. Looking at a flint scatter under the bank material of the excavation at Durrington Walls set me thinking, and these are only the most preliminary thoughts that I would welcome feedback on. 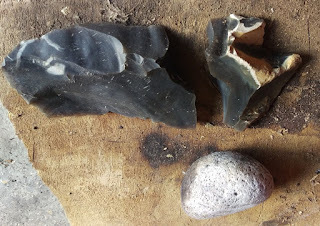 The shattered flint was mainly very fine shards and would seem to have been part of a cricket ball sized nodule that broke where it was found. Whether some shards were removed further examination will reveal. Under the shards was a broken (in situ) flint nodule, commonly known as a pot boiler, that showed the crazing and colouration of having been heated to a high temperature. It was thought its position was coincidental to the shards, which did not show obvious signs of having been heated. UPDATE 5/816 - A second, larger but very similar scatter has been found in the same trench resting on a bed of charcoal. The flint shards were so fine and so contained in a small area it didn’t appear that they had been knapped in the usual manner with the debitage falling onto the ground from a thigh, for instance. 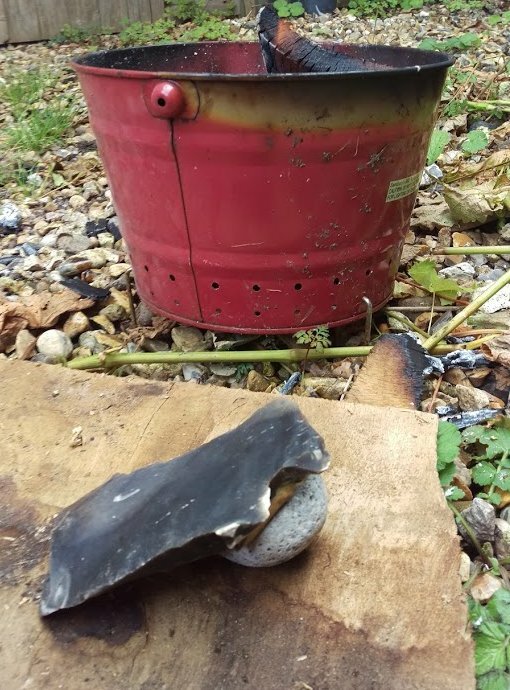 As an experiment, I have heated a flint nodule in an enclosed wooden fire to a high temperature and then placed a cold fracture-free piece of flint on top of the hot nodule as soon as it had been removed from the fire. There was a cracking sound and the cold flint appeared to have developed a fracture, and on gentling tapping it the flint broke in half. I believe there is possibility that “pot boiler” heated nodules were used to induce fracturing in flints and the production of shards in the culture and age of the building of the banks of Durrington Walls, Note I'm not suggesting they were used to fashion flint tools, just to bust open nodules to produce flakes that could then be knapped. John C. Whittaker in FLINTKNAPPING: MAKING AND USING STONE TOOLS, Second Edition. Austin: University of Texas Press (1995) is disparaging about the use of heat in the production of flint flakes but it may be that he is only considering it for the production of finished articles rather than a preliminary breaking of nodules to produce raw materials to be further worked. Many of the cryptocrystalline silicates can be improved by heat- treatment. This may in fact be the source of that absurd old story about making arrowheads by heating the stone and dripping cold water on it to crack off flakes (Eames 1915; Fraser 1908; Nagle 1914). Enough serious knappers have tried this (e.g., Ellis 1939) to show that it does not work, never did work, and could not work, but you will still hear it. Courtesy inhibits us from calling people liars, but if someone claims to have seen arrowheads made by fire and water or to have done it themselves, don't invest in any real estate with them. Nevertheless, heat can be used in stone working, although not for flaking. ELLIS, HOWARD HOLMES. 1939. Flint-working techniques of the American Indians: An experimental study. Columbus: Lithic Laboratory, Department of Archaeology, Ohio State Museum. Current Anthropology, Vol. 19, No. 2. (Jun., 1978), pp. 337-372. Alison Mercieca. Burnt and Broken: An Experimental Study of Heat Fracturing in Silcrete. Gregg, L. , and Richard J. Grybush. 1976. Thermally Altered Silicious Stone from Prehistoric Contexts: Intentional Versus Unintentional Alteration. Impressed with the experiment Tim. If I've understood it, the method you've used for fracturing is to heat up a piece of cold flint at very high speed so that it develops a high temperature gradient within the stone: The temperature gradient then leads to internal stresses within the stone and causes the fracturing (in the same say that fracturing can be caused by rapidly cooling an object using water). At first glance, the method could be useful for rapidly breaking up stone: The higher the temperature gradient, the better the method would be. Interesting thing about your experiment is that it creates a high instantaneous gradient rather than a high temperature: High temperatures would not necessarily be effective if the heat were built up slowly because the internal stresses within the stone are not high if the stone is heated evenly. We've got a family gathering in Salisbury soon so might be worth a chat if you're around. Thinking about it, you may have known my late uncle (David Morris): He was an agricultural advisor for the area with one of the government departments (going back in time quite a bit). Durrington Walls - Post Removal Thoughts.